Hurray for Hollywood! Celebrity Interior Designer Cathy Hobbs Shares Design Tips On The Return of Hollywood Regency Style With Sheknows.com! ≈ Comments Off on Hurray for Hollywood! 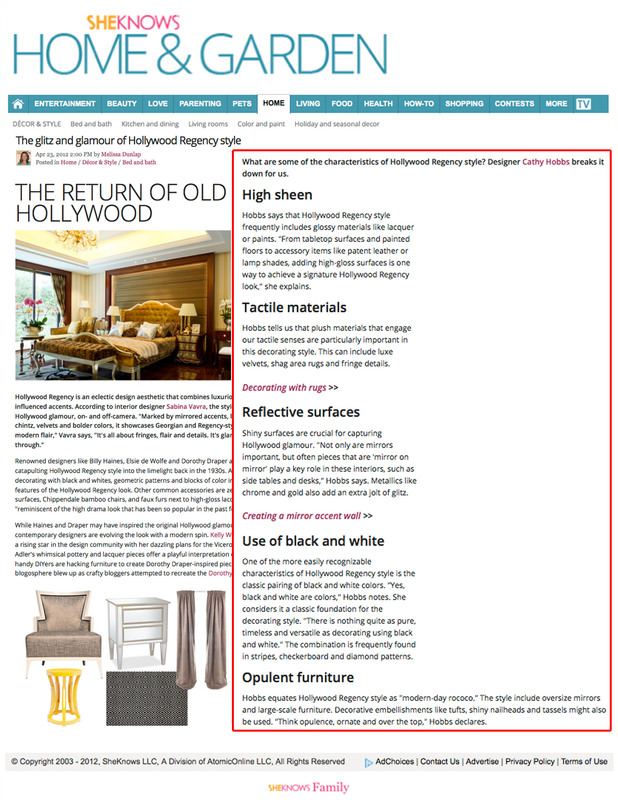 Celebrity Interior Designer Cathy Hobbs Shares Design Tips On The Return of Hollywood Regency Style With Sheknows.com! Renowned designers like Billy Haines, Elsie de Wolfe and Dorothy Draper are responsible for catapulting Hollywood Regency style into the limelight back in the 1930s. According to Vavra, decorating with black and whites, geometric patterns and blocks of color in acid yellows are all iconic features of the Hollywood Regency look. Other common accessories are zebra rugs, mirrored surfaces, Chippendale bamboo chairs, and faux furs next to high-gloss lacquered pieces. These are all “reminiscent of the high drama look that has been so popular in the past few years,” Vavra says. While Haines and Draper may have inspired the original Hollywood glamour movement, contemporary designers are evolving the look with a modern spin. Kelly Wearstler is quickly becoming a rising star in the design community with her dazzling plans for the Viceroy Santa Monica. Jonathan Adler’s whimsical pottery and lacquer pieces offer a playful interpretation of the glamour era. Even handy DIYers are hacking furniture to create Dorothy Draper-inspired pieces. A few years ago the blogosphere blew up as crafty bloggers attempted to recreate the Dorothy Draper Espana dresser. What are some of the characteristics of Hollywood Regency style? Designer Cathy Hobbs breaks it down for us. Hobbs says that Hollywood Regency style frequently includes glossy materials like lacquer or paints. “From tabletop surfaces and painted floors to accessory items like patent leather or lamp shades, adding high-gloss surfaces is one way to achieve a signature Hollywood Regency look,” she explains. Hobbs tells us that plush materials that engage our tactile senses are particularly important in this decorating style. This can include luxe velvets, shag area rugs and fringe details. Shiny surfaces are crucial for capturing Hollywood glamour. “Not only are mirrors important, but often pieces that are ‘mirror on mirror’ play a key role in these interiors, such as side tables and desks,” Hobbs says. 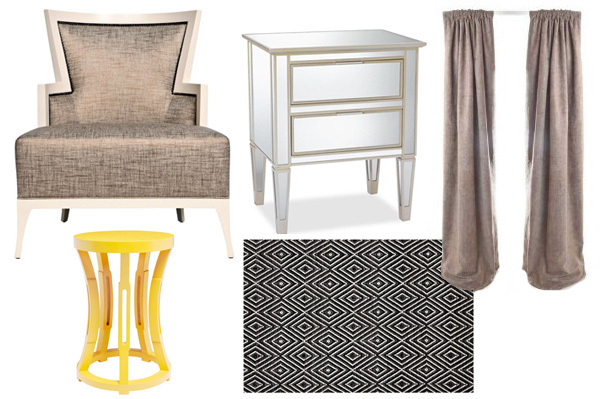 Metallics like chrome and gold also add an extra jolt of glitz. One of the more easily recognizable characteristics of Hollywood Regency style is the classic pairing of black and white colors. “Yes, black and white are colors,” Hobbs notes. 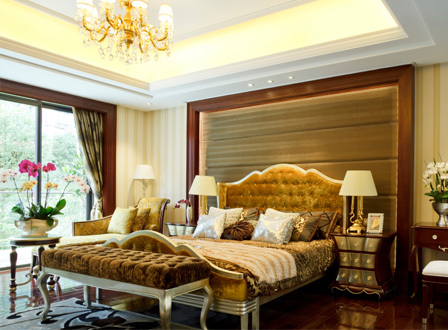 She considers it a classic foundation for the decorating style. “There is nothing quite as pure, timeless and versatile as decorating using black and white.” The combination is frequently found in stripes, checkerboard and diamond patterns. Hobbs equates Hollywood Regency style as “modern-day rococo.” The style include oversize mirrors and large-scale furniture. Decorative embellishments like tufts, shiny nailheads and tassels might also be used. “Think opulence, ornate and over the top,” Hobbs declares. This Morgan Lounge (Reagan Hayes) is a subtle nod to the look with a modern interpretation. Mirrors are a must for proper Hollywood glamour, so deck the walls with an ornate mirror or try a mirrored side table (Pottery Barn). Ground the floor with a black-and-white patterned rug — we like classic stripes or a diamond patterned rug (Wayfair.com) for a playful yet sophisticated look. Luxe velvet curtains (Amazon.com) give window treatments an upgrade. Lacquered furniture and pops of yellow are commonly found in Hollywood Regency style; this lacquered hourglass side table (Bungalow 5) combines both trends in one package. If you prefer a softer, feminine look, leave out the bright pops of color.